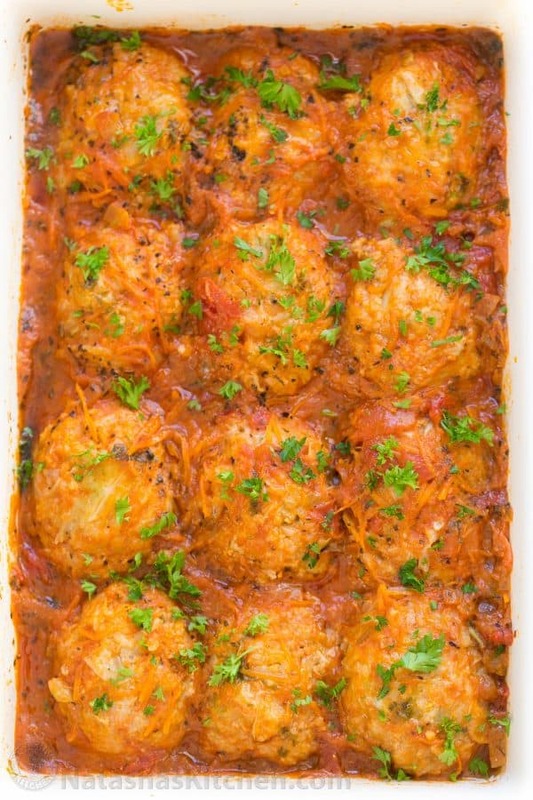 Do you love the taste of classic cabbage rolls (oh, yes, me! me! me! ), but don’t have time to roll them one by one, by one? 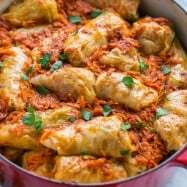 This lazy cabbage rolls recipe gives you the same great flavors of stuffed cabbage with very little effort. These are so so juicy and comforting. Did I mention my kids liked them? Actually, they loved them – it was a very enthusiastic “this is delicious!” from 7-year-old and my toddler quickly cleaned her plate. 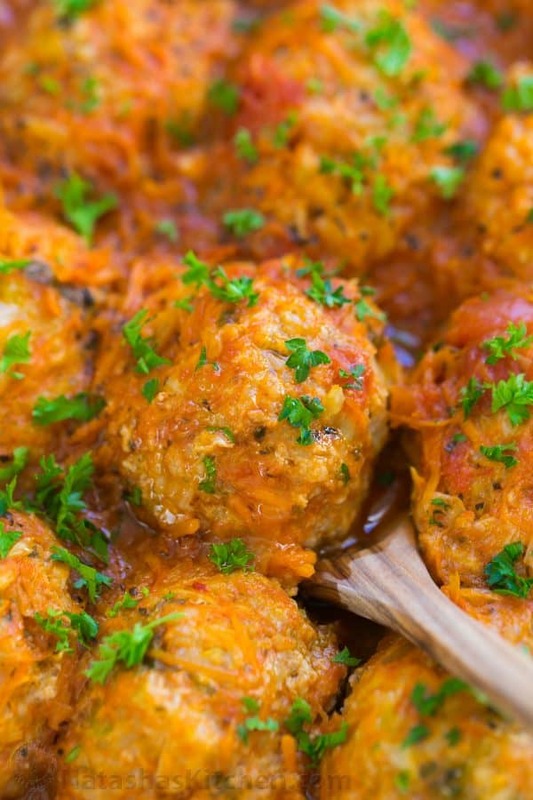 This recipe was shared with us by my Mom-in-law and it was an instant hit. 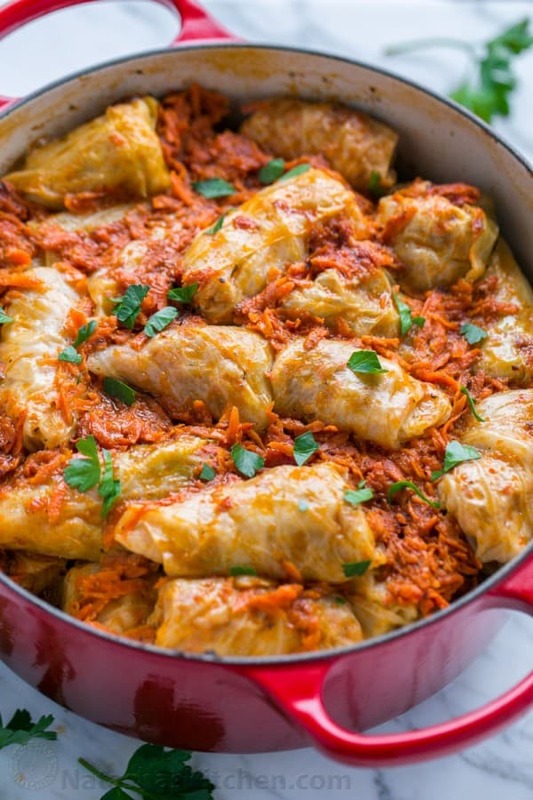 These come together in no time and completely satisfy the stuffed cabbage craving. It’s also a really great way to use up leftover rice and cabbage. It’s brilliant! Prep: Oil a 9×13 casserole dish, preheat oven to 425˚F. 1. 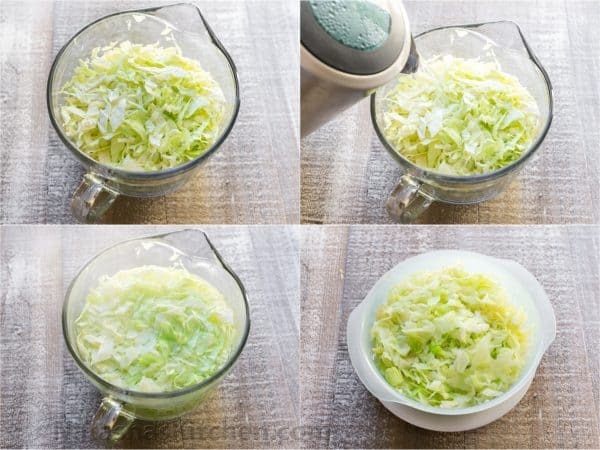 Slice cabbage into 1/4″ thin slices. Place in a heat proof bowl or pot, cover with boiling water and let sit 10 minutes to soften. Drain and squeeze out excess water with your hands. 2. 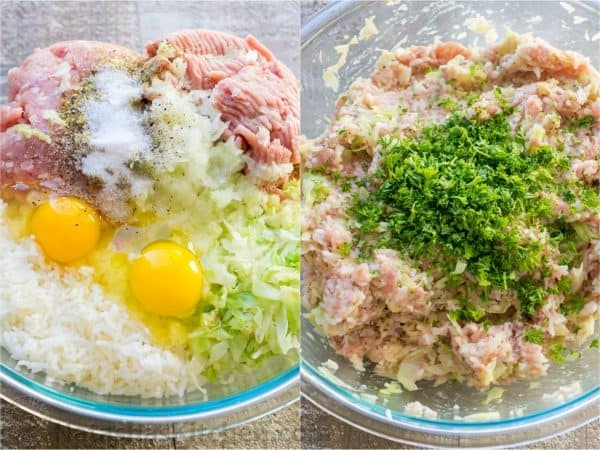 In a large mixing bowl, combine 1 lb ground turkey, 1 lb ground pork, drained cabbage and 4 cups cooked rice. Grate 1/2 large onion into meat mixture. Add 2 eggs, 1 tsp Mrs Dash, 1/2 tsp black pepper, 2 tsp salt, and 2 Tbsp finely chopped parsley. Mix well. 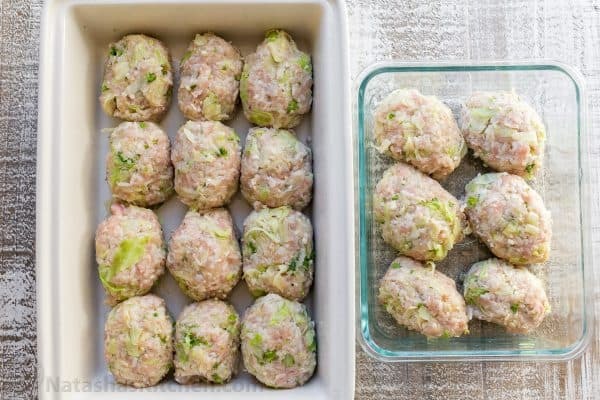 Form into potato-shaped patties with your hands, each with about 1/2 cup of the meat mixture. 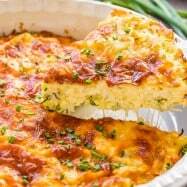 Arrange in prepared casserole. P.s. my larger casserole dish was a smaller 9×12 so they didn’t all fit in 1 pan. This is why I baked it in 2 separate dishes. If you use a 9×13, they should all fit :). 3. For the sauce, finely dice remaining 1/2 large onion. Heat a large pot over medium/high heat and add 1 Tbsp oil and 3 Tbsp butter. Add diced onion and sauté 5 minutes, stirring occassionally or until softened. Add julienned carrot and cook another 3 minutes or until softened. Add 2 cups marinara and 3 cups hot water and bring to a boil. Add 1/4 tsp salt and 1/4 tsp Mrs Dash, or season to taste. 4. Pour sauce over patties until they are nearly covered. Cover with foil and bake on medium rack at 425˚F for 40 min. 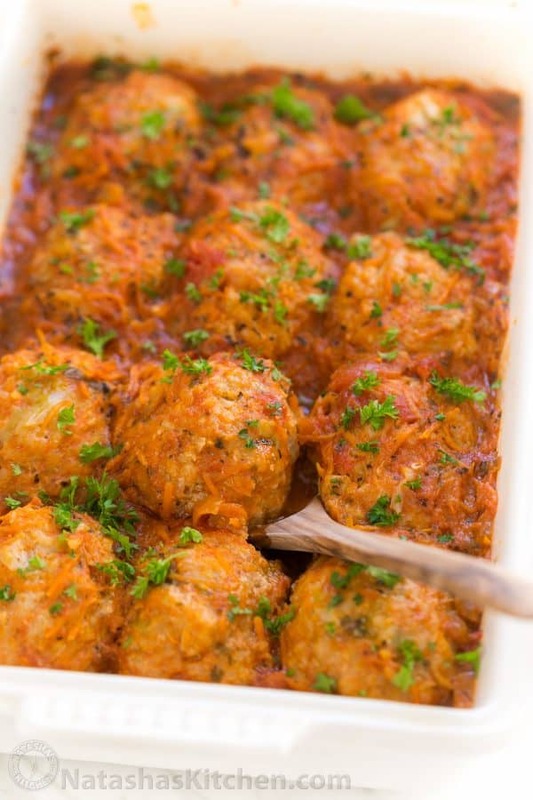 To serve, plate the lazy stuffed cabbage and spoon the extra juice over the top. Serve with sour cream (my favorite) or plain Greek yogurt. 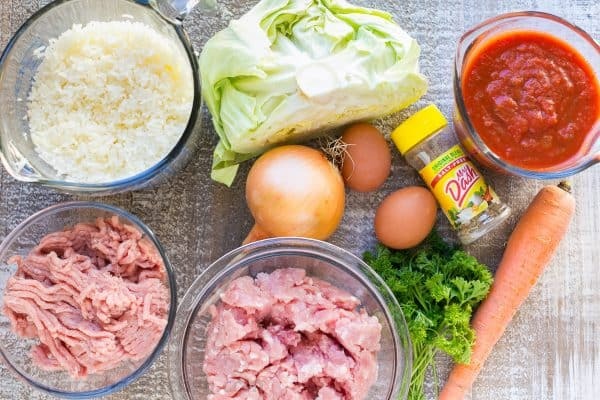 This lazy cabbage rolls recipe gives you the same great flavors of stuffed cabbage with much less effort. Lazy cabbage rolls are so juicy and comforting. Oil a 9x13 casserole dish, preheat oven to 425˚F. Slice cabbage into 1/4" thin slices. Place in a heat proof bowl, cover with boiling water and let sit 10 min to soften. Drain and squeeze out excess water with your hands. 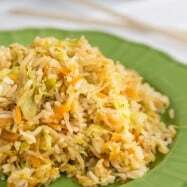 In a large mixing bowl, combine ground turkey, ground pork, drained cabbage and 4 cups cooked rice. Grate 1/2 large onion into meat mixture. Add 2 eggs, 1 tsp Mrs Dash, 1/2 tsp black pepper, 2 tsp salt, and 2 Tbsp finely chopped parsley. Mix well. Form into potato-shaped patties with your hands (each should be about 1/2 cup of the meat mixture). Arrange in oiled casserole. For the sauce, finely dice remaining 1/2 large onion. Heat a large pot over medium/high heat and add 1 Tbsp oil and 3 Tbsp butter. Add diced onion and sauté 5 minutes, stirring occassionally or until softened. 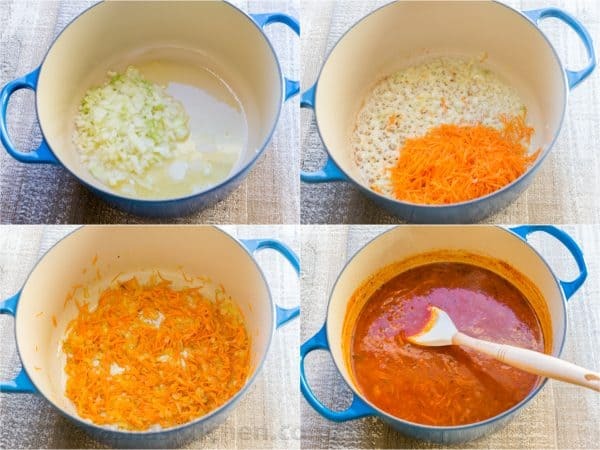 Add julienned carrot and cook another 3 minutes or until softened. Add 2 cups marinara and 3 cups hot water and bring to a boil. Add 1/4 tsp salt and 1/4 tsp Mrs Dash, or season to taste. Pour sauce over patties until they are nearly covered. Cover with foil and bake on medium rack at 425˚F for 40 min. 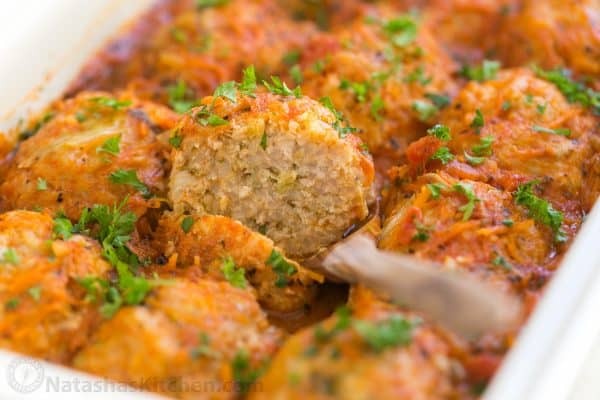 To serve, plate the lazy stuffed cabbage and spoon the extra juice over the top. Serve with sour cream (my favorite) or plain Greek yogurt. Check out our original Cabbage Rolls Video Recipe here if you roll old school and really want to impress your peeps :). Need more leftover cabbage ideas? 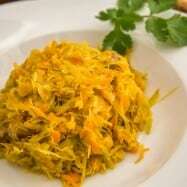 Check out all of our cabbage recipes here. Oh, my goodness! I mentioned my neighbor in a previous post? She used to make traditional cabbage rolls ALL THE TIME; I could smell them walking home from school (cue that it was the perfect time to pop in and tell her all about my school day! *grin*). Most of my childhood memory includes getting yelled at by my mother, punampaul.com and eat your veggies; but I used to pay no heed to it. However as time passes, most of us come around to eating vegetables as we are aware of the countless benefits they have for our health. 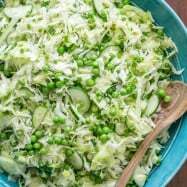 Cabbage is especially one of the world’s most nutrient dense vegetables readily available for us to enjoy, rich in essential vitamins such as C, B6, K, saturated fat, thiammin, calcium, iron, magnesium phosphorus and a good source of dietary fibers. But I never liked any cabbage recipe other than in noodles. These were wonderful! Thank you so much for the recipe! I did change a few things, as I know my families taste. Instead of using 2 cups of Marinara and 3 Cups hot water, I used 4 cups Marinara and 1 cup water. Also, instead of regular salt, I used Kosher. And totally by accident, I put the carrots in the cabbage rolls instead of the sauce. They loved it! 🙂 Again, thank you so much! We grow cabbage and now I have a wonderful new recipe that can use our cabbage! Not very nice comment! Why you did not ask your grandma for recipe instead of assaulting Natasha here? She is sharing her recipe. Even I am ester Europian, and we always put meet in it. Going to make it tomorrow, for sure it tastes delicious like the rest of Natasha recipes what I have tried so far. Hi Vickie, I kept the cooking time and temperature the same. This recipe looks great and hopefully my picky eater grandsons will enjoy them. Hi Natasha, do you think I can use long grain and wild rice instead of white rice in this recipe? 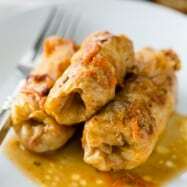 I make this recipe quite often and absolutely love how easy and delicious the “cabbage rolls” turn out. I wasn’t sure a mushroom gravy would go well with the marinara, but your word is good enough for me. Will be making this over the holidays. First I wanted to say that I have made these several times and they are delicious! They taste exactly like regular goluptsi, so I can easily satisfy the craving without hours upon hours of work! For a tired, full time night shift working busy pregnant mom of 2, soon to be 3, this is awesome! Thank you for your recipe. I wanted to make some comments. I made half of your recipe, and I shaped the patties a bit smaller, and it barely fit into my glass 9×13 baking dish. I was also wondering if I can place two layers of patties instead of one. Has anyone tried this successfully? This.Is.So.Delicious!!! I was always too busy (or too lazy:)) to make the “golubti” traditional way even though my husband grew up eating them almost every week and requested them often. I just made Lazy Cabbage Rolls tonight. Simple to make and very tasty! 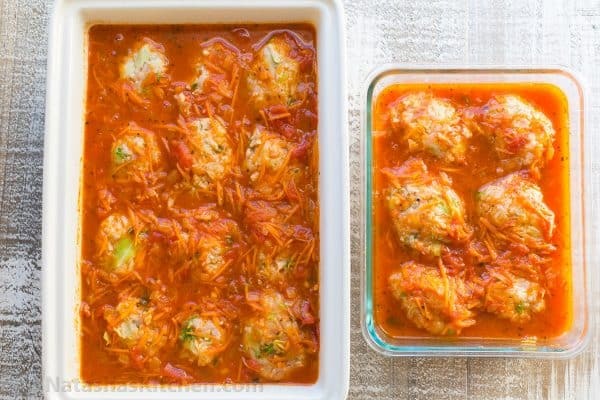 I love traditional cabbage rolls but don’t have the patience and time to make them. The lazy cabbage roll recipe is going into my list of standards. YUM! So good and easy, I appreciate this recipe, ALOT! I used venison (husband hunts) and turkey instead, also added mushrooms to the sauce and it was delicious… thank you for sharing! Since I have never managed to learn how to roll this cabbage into a nice shape – I am going to try this method!!! The update on the result will follow as soon as I make it. There are just two of us. Do these freeze well? I love to have frozen dinners when I’m busy. Yumm, is all I can say!!! I can’t wait to make it and eat it. Girl what kind of rice did you use? When do you add the set aside cabbage?